KISSIMMEE, Fla. – Dirk Tavenner has come close to qualifying for the Wrangler National Finals Rodeo a few times, finishing inside the top 25 the last three years. His effort on Saturday might turn out to be a key factor in Tavenner’s run at Las Vegas this season. 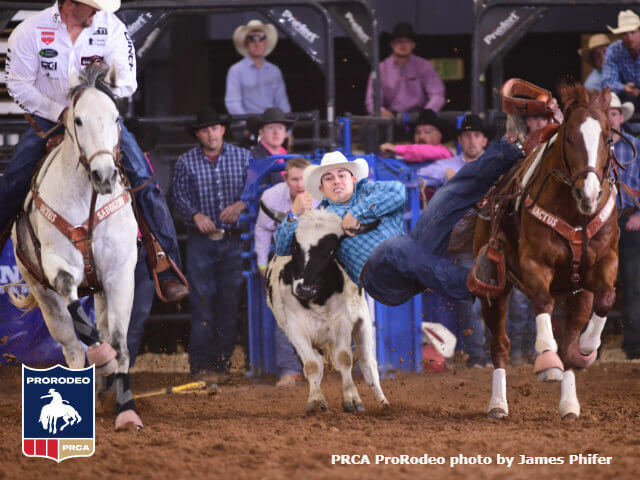 The steer wrestler from Rigby, Idaho, posted a 3.7-second run in the second round at the RAM National Circuit Finals Rodeo to take second in the round and win the average in 7.8 seconds on two head. Tavenner already has cashed in for $14,404. He also placed third in the first round. He and seven other steer wrestlers, along with the top eight contestants in the rest of the events return Sunday for the semifinals of the RAM NCFR. Tavenner entered the weekend in 29th place in the PRCA | RAM World Standings with $13,049. Tavenner was riding Scooter, the two-time, reigning PRCA | AQHA Steer Wrestling Horse of the Year. Tyler Pearson, the 2017 Steer Wrestling World Champion and a co-owner of Scooter with Kyle Irwin, hazed for Tavenner. “I had a great steer and great hazing-horse combination, it was awesome,” Tavenner said. The final round will consist of eight riders competing for four spots in a one-go format. The championship round will also be one go. The RAM NCFR will air on CBS Sports Network on April 8 at 8:30 p.m. (ET). Here’s a look at who advanced to Sunday’s RAM National Circuit Finals Rodeo championship. * Brett Custer, who was ninth with 71, will replace Gonzalez if Gonzalez is too injured to compete.